A wedding should be unique and personalized to match the couple’s personal style and interests while also considering the guest experience. Pretty Flowers offers florals for clients with a love of flowers and free expression. Our weddings have no rules. This Bridal bouquet had red ‘Piano’ Garden roses, dark centered red Anemones, Viburnum Berries, Scabiosa and Pepperberry. Amy’s bright bouquet really popped against the gray October sky when they married at her family’s farm in Auburn, Maine. 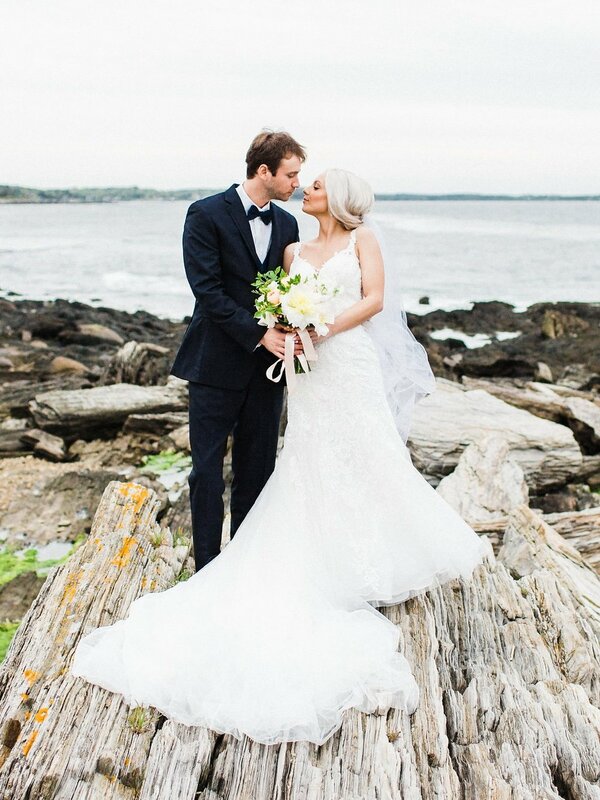 Eliza Hulme chose a soft pink ruffly wedding dress for her October wedding in Harpswell, Maine. 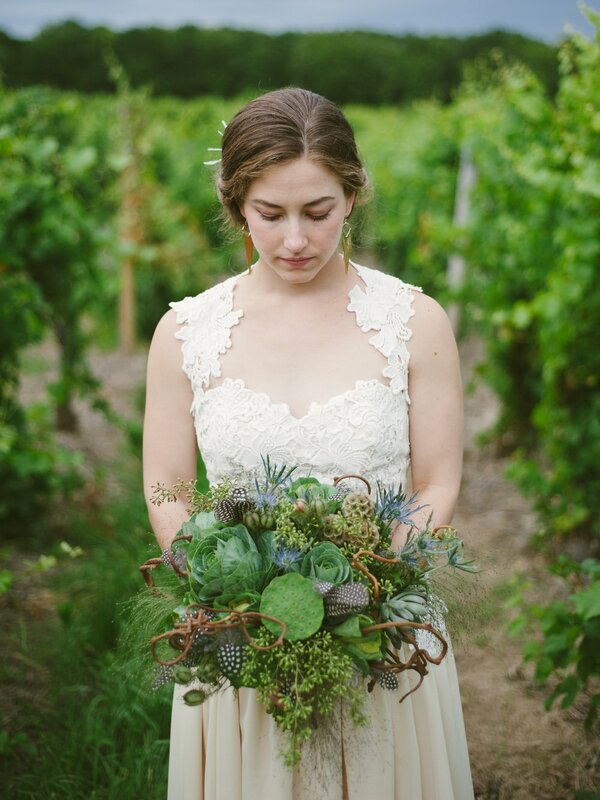 We used the dress as inspiration for her bridal bouquet. We chose feminine and romantic flowers including ‘Juliet’ Garden Roses, ruby red Ranunculus and Jasmine vine while also adding a little whimsy with blue Viburnum Berries and Seeded Eucalyptus. Sara asked for a bouquet without flowers. Here, we used Ornamental Kale, Lotus Pods, Guinea Fowl Feathers, Kiwi Vine, Nigella Pods, Eryngium, Explosion Grass, Seeded Eucalyptus, Succulents and Scabiosa Pods. Lindsey + Jason fell in love while sailing. Of course, it seemed fitting to gather their closest friends and family and marry on a schooner in a small private ceremony and then sail to their wedding reception in Boothbay Harbor, Maine. 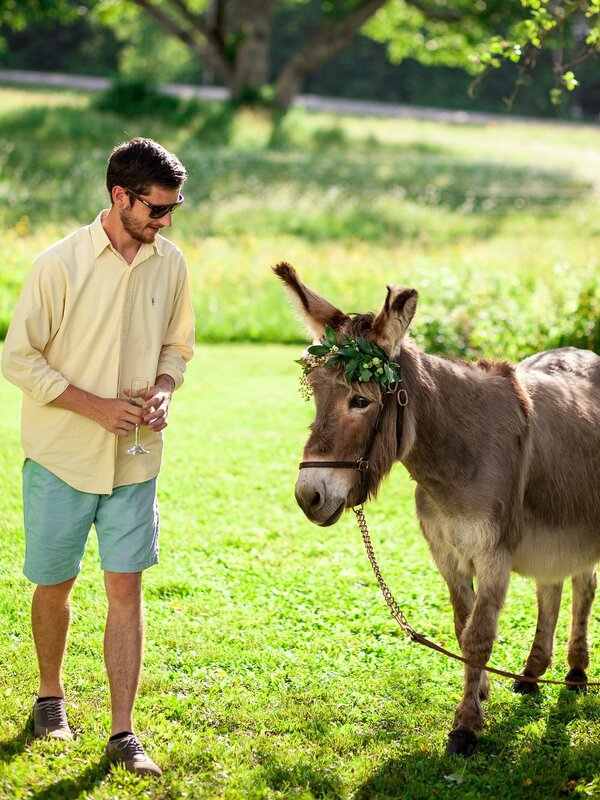 Willie was Claire’s family pet and was to be included in the festivities at their summer wedding in West Bath, Maine. We decorated his bridal with light greenery and a few Helleborus flowers as an accent. A dress code engages guests in a playful way and makes for a memorable experience. Eliza + Tim kindly requested their guests wear plaid. Some took it to heart. 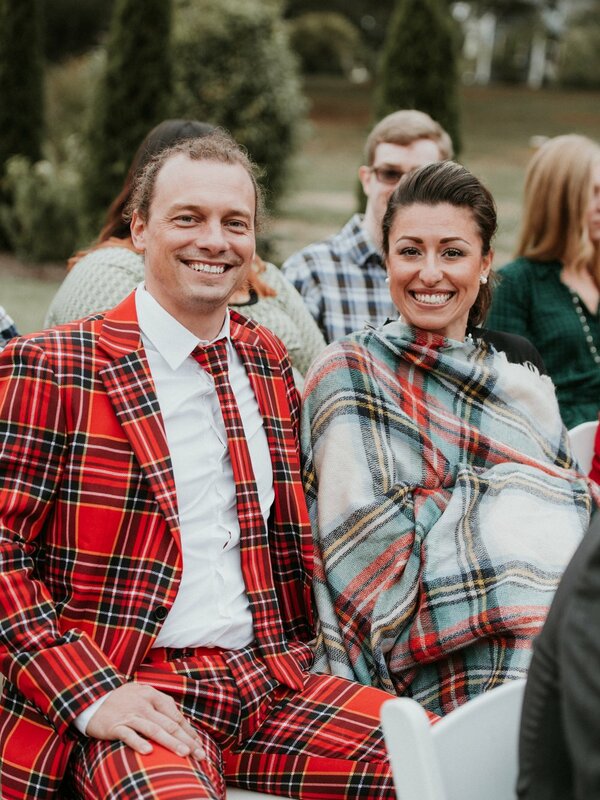 Most Mainers already have plaid in their closets and the fabric is often heavier- perfect for a late day October wedding. Danielle was raised in a funeral home and was around flowers on a regular basis- but not for joyous or celebratory occasions. Understandably, flowers were not something she grew up loving. 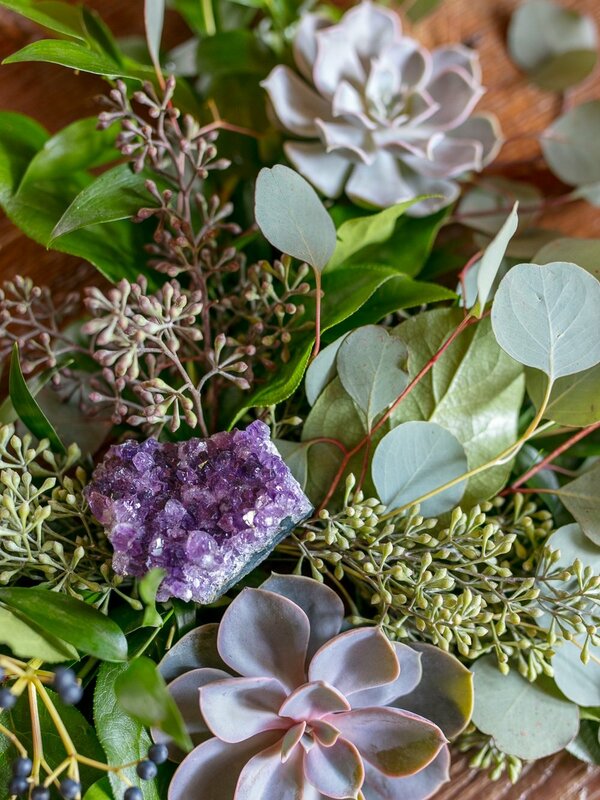 She asked us to create a tablescape using only greenery and succulents. Here, we used ‘Silver Dollar Eucalyptus’, Viburnum Berries, Ruscus, Salal and Seeded Eucalyptus. Danielle provided her own Amethyst chunks which added a little sparkle. Not only was Karina an identical twin, but her sister also wore white- causing many to do a double take! This may not work for everyone but because Karina + Seth’s wedding flowers were also subdued it wasn’t very distracting. The cut of their dresses also signifies who is who. Amy hired her handyman/husband aka Maloney Marine Rigging to saw Cheryl’s juggling baton in half. The bouquet stems fit snuggly into the cavity and Amy laced it back up with the holes Mr. Maloney drilled into the sides. Take the pressure off yourselves and have an intimate ceremony celebrating your committment to one another. Courtney and Teddy married in Maine in June. Spring offers some of the sweetest smelling flowers and of course, Dahlias. Courtney’s bouquet had Sweet Peas, Dahlias and Blueberries on the branch to add soft texture and color.